Pineapple carrot cake, sounds tasty doesn’t it? These cupcakes are a low calorie delight. My friend Jessie, from Little Calorie recommended these. 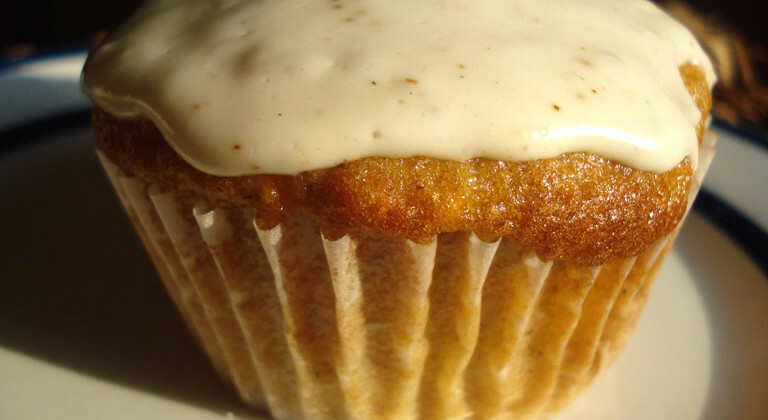 These cupcakes are so flavorful and moist; you even get the cream cheese frosting. Best part is, you don’t have to feel guilty after eating one because they are almost half the calories of your traditional carrot cake with cream cheese frosting. I made these cupcakes yesterday with Sasha; she is really into helping me out. The cupcakes are really dense, without being dry. I used only the pineapple, and left out the raisins and walnuts. The original recipe can be found here http://www.fitnessandfreebies.com/local/carrotcake.html I adapted it with the ingredients that I had on hand. The cake part was delicious, however the frosting was mediocre. I may have added too much pineapple juice to it, because it was a little runnier than I would expect frosting to be. I will most certainly make the cake recipe again, but figure out a new and better recipe for the frosting. Preheat oven to 350 degrees F. Spray spray 12 cupcake liners with nonstick, vegetable cooking spray, place into muffin-tins. Dust lightly with all-purpose flour. Set aside. Combine all cake ingredients except carrots in large mixing bowl. Beat at low speed of electric mixer just until combined. Beat at high speed for 2 minutes, scraping bowl frequently. Fold in carrots. Pour batter so liners are 3/4 full. Bake for 20 to 25 minutes, or until wooden pick inserted in center comes out clean. In small mixing bowl, combine cheese and sugar. Mix until combined. Slowly add pineapple juice. Beat at medium speed of electric mixer until smooth. Spread topping on cooled cake. Sprinkle with additional shredded carrot, if desired.